The task for this unit is to create an OER (alone or in collaboration) and to license it. We can upload our OER to the course wiki (link) or to our own platform. Additional we should tag it by edutags. 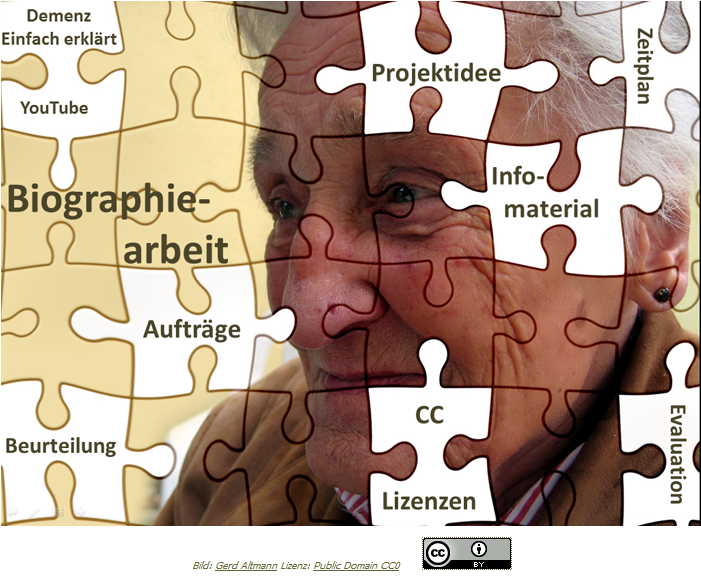 After thorough examination of the course material, including the two live sessions about ‘How to create OER’ and ‘OER licenzes’ I decided to create an OER about reminiscing work with elderly. The initial idea emerged during another MOOC, the MobiMOOC organzied by Ignatia de Waard. The plan at the beginning was to create an OER with other participants and you might remember my enthusiasm that I quickly found fellow campaigner with an interest in health-related topics. We/ I even created an interest group , but communication and interest ceased down and came to a stop. I have to admit, after visiting the forum for a duration of about two or three weeks, I kind of gave up myself and just occasionally check the forum. Well, one thing is for sure, each MOOC has its own momentum, like I stated before in my posting ‘Do all MOOCs follow the same pattern‘. Below is an example from Damian Duchamp’s that explains OER. As you see the green area is the least restricted OER where you can freely share-alike with attribution, whereas the red section represents the standard copyright. Source: Image from Damian Duchamp’s blog. According to Damian Duchamp’s advice I decided to create my OER using HTML/CSS format and adding additional doc files since they are a lot easier to change or remix. The intro (OER_map.html) is a linkable map which link to the different resources. The OER is in German, however you can download a similar plan in English here. At the moment my OER can be found in my Dropbox until I have my own domain. The only disadvantage is that you would need to download file by file, since it does not open within the Dropbox, therefore here a link to a zip.file. Sorry for the unconvenience 😦 It will be soon fixed.